Because finding a perfume your cousin will like can get tricky, here’s a selection of fragrant objects you can confidently slip under the Christmas tree. Papier d’Arménie. Never mind its name, the little booklet created in 1885 is French – from the Parisian suburb of Montrouge, actually. Because it doesn’t cost much, you can add it as a bonus to pretty much any gift, it’ll make the surroundings of the tree smell like benzoin. I especially like the limited edition whose smell was composed by perfumer Francis Kurkdjian for the Year of Armenia in France, in 2008: incense, myrrh, woody notes and vanilla. It smells delicious and will make the whole room smell, even if you don’t light it up. Otherwise, there is also the pretty booklet that was recently redesigned by illustrator Pierre-Louis Mascia, who adorned it with his signature motif: a stylish daisy. Papier d’Arménie Francis Kurkdjian, 8€ for two booklets; Papier d’Arménie Pierre-Louis Mascia, 24€ for a box of 6 booklets, available from Papier d’Arménie’s online shop. A sandalwood soap. I’ve been using the same Mysore Sandal Soap as the Indians for a few years, they love it and I can find it for less than 3€ in the exotic supermarkets of my neighborhood (such as this one). If I belive the box, it is the only soap in the world that’s made with pure Mysore Sandalwood oil, a luxurious and rare material. Atelier Cologne offers a very chic alternative with its Santal Carmin soap. Its fragrance mixes woods with citrus and saffron, all in a 100% vegetal base, enriched with aloe vera and shea butter. Santal Carmin Soap, Atelier Cologne, 17€. Available from Atelier Cologne’s online boutique. Mysore Sandal Soap, about 2€. Available from La Boutique Bio. Incense sticks. Another great frind from exotic supermarkets is Nag Shampa Incense. Made from natural resins, sandalwood powder, essential oils and dry champa flowers – those heady-smelling flowers Indian women use to decorate their hair – it is probably the best-selling Indian incense in the world. 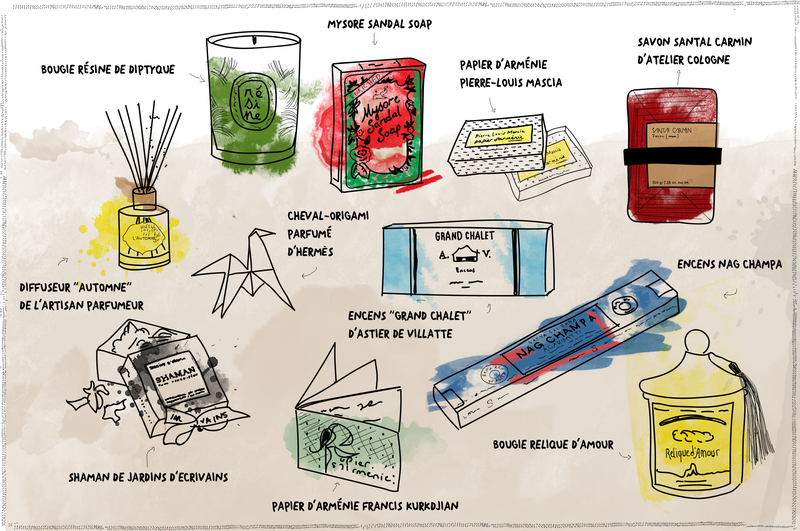 This winter, Astier de Villatte also makes great artisanal incense sticks. The Grand Chalet smell pays homage to the chalet owned by painter Balthus, in Switzerland, bathed in the milky, honey-like and slightly citrusy smell of a secular lime tree. Nag Shampa incense, 18 sticks, about 1,20€. On sale on Biorient. Fragrant animals from Hermès. Alright, this is luxury. But we could expect no less from Hermès, who just launched a beautiful home fragrance line. This origami-horse made of paper smells like whichever of the five perfumes composed by Céline Ellena you prefer. Made for occasional use (they smell strong but only for a few months), it is great for packing in a suitcase and transposing, somewhere else, the smell of one’s home. A home fragrance diffuser. Through its woodsticks, this diffuser tells us about summer in the Grasse country: notes of jasmine and orange blossom, just freshened by honeysuckle, on a base of tonka bean and honey. But who care about the season, it just smells so good. A perfumed candle. You’re right, it could be the most unoriginal gift ever. But not all perfumed candles were born equal. See for yourself with this Relique d’Amour candle by Oriza L. Legrand, which takes us with great realism into the chapel of a Cistercian abbey: cold stone, furniture polish and incense. It is beautiful, original, moving. In the figurative category, check out Resine from Diptyque, an exercice of style around the theme of the pine tree, its bark, resin and needles. Relique d’Amour candle, Oriza L. Legrand, 130g, 40€. Available on Oriza L. Legrand’s online shop. Résine candle, Diptyque, 190g, 55€. Available on Diptyque’s online shop. A sage fumigation. First because it’s probably the most original gift around. But also because it can do two things: this white sage from California, which you can light up like incense, will kick out nasty smells and purify the atmosphere. According to the shamans who use it, it also gets you rid of negative energies and bad mood. That calls for checking. Shaman, Jardin d’Ecrivains, 50g, 60€. Available on Jardins d’Ecrivains’ online shop.